When determining your target audience or gauging their perception of your product or service, a well designed, carefully thought out survey can be the key to success. But (there is always a but), the survey has to be executed and analyzed correctly in order to be of measurable value to you or to your clients. Without measurement – you’ve no doubt wasted your carefully measured time. If you’re new to this, you may want to consider using a short online survey, as they are typically less expensive to administer. Plus, they yield quick responses and analyzing the results is usually quite simple. Whether you’ve chosen to reach your audience online, snail-mail, or by telephone you should consider which methodology will get your desired tidbits of information. Lynnette Leathers, President of Mindspot Research, and one of evok’s strategic partners, recommends using online surveys. “The online population is now reflecting the general market population for most segments. Mindspot specializes in online research because today’s marketplace and the future are online and surveys can be completed via computer, mobile phone, or text. Today, we almost never mail a survey or dial a home phone number. Typical Customer Satisfaction surveys are designed to measure just that – customer satisfaction. And, a well-designed survey will also measure how loyal your customers are to your company, product or service. You can even add specific questions that will give you a Net Promoter Score (NPS) that reveals the percentage of your customers which are promoters or detractors. This type of survey can identify what you do well and uncover opportunities to improve your business. An A & U survey will measure aided and unaided awareness, the perceived benefits of your product or service, and the buying and usage habits for your product. Know what questions you need answered. In order to get the information you are looking for, you must figure out exactly what questions you need answered. Keep the survey relevant to your customers. For the best results the survey should be simple, easy to understand, and brief (10 minutes or less). Be considerate of the respondent’s time. Let your audience know up front how long the survey should take to complete. Tell your respondent WIIFM: Offer incentives to get your desired sample size. This could be as simple as a discount, drawing or gift card. Don’t keep secrets. Start with a quick introduction of what the survey is about–this will give your respondents an idea of what to expect and a little bit of context often helps when answering your questions. Be Polite. Thank your audience up front and at the conclusion of the survey. Make sure you are talking to the right people. Use screening questions to qualify the person. For example: Do you currently use XYZ brand? Use a logical flow. Start with broad questions and then get more specific. Incorporate questions with a rating scale, to provide you with easy to interpret and actionable data. Leave enough space for people to tell you all about it. They will – your customers want to help you. If you ask open-ended questions, leave enough space for people to answer. If you use a rating scale keep the order consistent throughout the survey so that there are no mix-ups. Ask demographic questions at the end of a survey unless you are using them as screening criteria (am I talking to the right person?) If you ask too many personal questions upfront, people may not complete your survey. What is the last year of schooling you have completed? Always pre-test the survey with co-workers before deploying to make sure the flow is logical, key questions weren’t missed, and there are no programming errors and consider a “soft-launch” your survey. Only send the survey to a small percentage 5%-20% of your potential respondents in case there is an error that you need to correct. After you’ve designed the perfect survey, administered it, received responses, don’t overlook the most important thing – tabulating and analyzing the results. Use these results to make recommendations on what your company could be doing better and create a plan with your what you have learned. If you are looking for an inexpensive way to conduct surveys, check out some of the subscription-based survey tools like surveymonkey.com, constantcontact.com, or zoomerang.com. You can find templates, instructions and, sample questions to help you get you started. Now I know why Tallahassee is Florida’s capitol…and it is not because it’s difficult to spell. Our visit to Florida State University this week was complimented by roads covered with canopies of live oak trees dripping with Spanish moss, blue skies, and a light breeze. The legislature is in session and people are friendly. Our friends at Catch Your Limit have an office located there and they provide strategic marketing consulting and fish cleaning services. 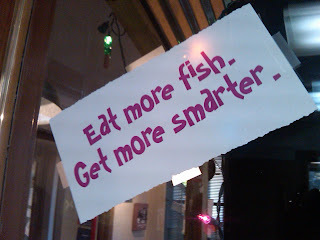 If you don’t believe those two skills go together check out http://www.catchyourlimit.com/. They also group teach the Creative Strategy class in the School of Communications at FSU. When they asked me if I had a client that would be good for their class project…I said in fact…I do….Vanity stores would love some new ideas. They are a cool retail apparel chain that has hundreds of stores located mainly in the mid-west and a relatively new online presence at http://www.evanity.com/. Vanity sent us to Tallahassee to scoop up the results of the final project that they have been working on for weeks. Here’s how it worked: the class divided up into 5 ad agencies and competed for the clients business. Then we viewed the presentations and picked the winner- which let me just tell you now was a much more difficult task than I anticipated. They exceeded my expectations, which those of you who know me, know start at “high expectations.” Wow. I learned a lot. Starting with, how do you stay current in the marketing world? Teach a class and get some fresh ideas from your students. What surprised me is that I got inspired by the students and about the future of the business. There is a new crop of energetic young people that have some innovative and big new ideas. The students are “digital natives” meaning that their world has always included technology and the internet and they don’t know a world without it. And, the way that they approach marketing reflects that reality. Now, there is no way that I can cover all the ideas in the blog today but I am delighted to say I have some exciting topics for upcoming blogs! This is a great question and here is my answer: Hard work counts, and the big idea is going to give you the hook; however, you have to keep your audience interested, and convince them you can get the job done. The competition is fierce and standing out from the other agencies is going to be an on-going challenge. The good news is that competition will make you better– so we say bring it on! At the end of the day…it all goes back to the research that can help you know and understand your customer. Your message must be relevant to your customer and it has to be communicated to the decision makers in a clear, engaging, and confident manner. Otherwise how will you reach their consumers? There are other factors, in the “real world” everyone has budget restraints within which you must work and everyone has an opinion and you rarely know all the variables that factor into the final decision. And, you’ll notice there are a lot of “ands”. The appropriate answer isn’t either/or, it’s Both And. You need Big Ideas AND excellent presentation. We would like to thank the class at FSU for the privilege of being their client this semester. And, in closing…. “The real world” is closer than you might think. People are not all that interested in YOU the blogger – your readers are interested in what you can teach them. It’s not about how many people read you it’s about the quality of what you have to say to them. For example, I don’t care if you Tweet what you had for breakfast – a banana and a cup of coffee. Heck you have 140 characters-why not at least use them and take us to your tiny url? Suppose you Tweet something meaningful like “I am eating a banana shake everyday for breakfast and I have lost 5 pounds in the past 2 weeks”. It works a lot like sales: You need features, advantages, and benefits to be interesting. The basics work for Twitter, Selling, and Blogging. We have become an instant-gratification- society (Now please!) and if someone can save you time and show the value it is worthwhile. Blogging is an ego-buster. I recently read an article in CopyBlogger (one of my favorite blogs) that suggests if you blog you should check your ego at the door. It’s true. It’s whatcha got for me -your reader and if you don’t have something good I am going to tell you or even worse – I am not going to say a word! I share my technology insights and half the time I am stumbling along figuring out how to use the latest stuff…you may recall my Blogs on Delicious and my slight addiction to Facebook and trying to figure out what was going on in the social networking world. Now because things change and evolve quickly I am working my way through Discus and Tweet Deck. I have joined Third Tribe a blogging community but only because I have a not-so-secret crush on Seth Godin and I am pretty sure that Chris Brodan is going to teach me something – I just have no idea what it is yet. It’s like what I had for breakfast versus the killer shake recipe. Give me something I can use! Your readers choose what you provide if you are listening. Are you listening? When I first started writing my blog I wanted everyone to like it and read it. However, then I remembered I am in Marketing! And, Marketing 101 can be summed up with these simple words from David Ogilvy, “You can’t be everything to everybody” and funny enough, it’s the same with blogging. What have you learned about blogging? Let me hear from you. I’m listening.